BHOPAL: What was meant to be a big show in presence of Union minister Nitin Gadkari, turned into a major embarrassment for the party. The Union minister had arrived for the inauguration of road projects and announcements about National Highways but what he witnessed was something else. Asha workers raised slogans while black flags were also waved by Congress workers. Further, as local MP Jyotiraditya Scindia was not called to the event, his supporter--MLA Mahendra Singh Sisodia protested and he was forced to leave the dais. 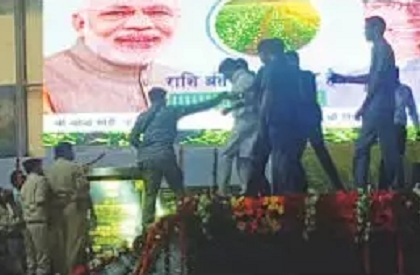 After Sisodia announced this, security personnnel pushed him down from the stage in full public view. Worse, the Anganwadi workers raised slogans when the Union minister was on the mike. Angry farmers were also there as they haven't been paid their dues for long. They had come with sugar canes and staged a demonstration. And a bus that was bringing people to attend the event, hit two girls who were critically injured. Clearly, it turned out to be anti-climax. Far from being BJP's mega show on Scindia's turf, it showed the party's weakness and mismanagement apart from unrest and anger of various sections.